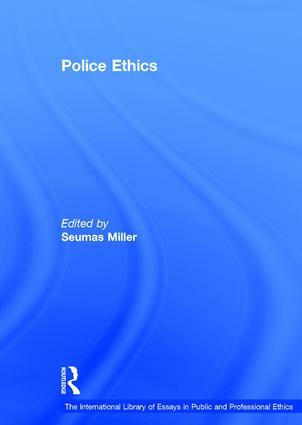 This important volume brings together many of the most influential articles and essays in the emerging field of police ethics, and specifically the philosophical literature on ethical issues that arise in policing. Topics covered include theories of policing; police authority and police discretion; police culture; corruption; deadly force and rights of suspects. Contents: Series preface; introduction. Part I Theories of Policing: The capacity to use force as the core of the police role, Egon Bittner; A social contract perspective on the police role, Howard S. Cohen and Michael Feldberg; Moral foundations of policing, John Kleinig; Human rights and the institution of the police, Seumas Miller. Part II Police Authority and Police Discretion: 2 principles of policing, Lord Scarman; The police and their rules of office: an ethical analysis, William C. Heffernan; Police discretion, Laurence Lustgarten; The pervasive false pretense of full enforcement, K.C. Davis; police discretion, legality and morality, James F. Doyle; Is police discretion justified in a free society?, Jeffrey Reiman; Selective enforcement and the rule of law, John Kleinig. Part III Police Culture: A sketch of the policemen's 'working personality', Jerome H. Skolnick; Police culture, Steve James and Ian Warren; Loyalty: the police, R.E. Ewin; The problematic virtue of loyalty, John Kleinig; 3 types of leadership, William C. Heffernan. Part IV Police Corruption: Becoming bent: moral careers of corrupt policemen, Lawrence Sherman; Exploiting police authority, Howard Cohen ; The Dirty Harry problem, Carl B. Klockars; Tragedy and 'noble cause' corruption, Edwin J. Delattre. Part V Deadly Force: Tennessee v. Garner, US Supreme Court; Deadly force, P.A.J. Waddington; Shootings by police in Victoria: the ethical issues, Seumas Miller. Part VI Rights of Suspects: Deception by police, Jerome Skolnick; Who really gets stung? Some issues raised by the new police undercover work, Gary T. Marx; The serpent beguiled me and I did eat: entrapment and the creation of crime, Gerald Dworkin; The ethics of deceptive interrogation, Jerome H. Skolnick and Richard A. Leo; Name index. Seumas Miller is Professor at the Centre for Applied Philosophy and Public Ethics, Charles Sturt University, Australia.